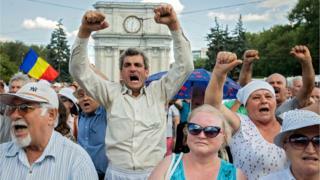 Protesters have set up camp in Moldova's capital to demand the president's resignation and early elections after a $1bn bank fraud. Demonstrators erected dozens of tents in Chisinau's national square where tens of thousands took part in a mass rally on Sunday. They called for action after living standards were damaged by the fraud. The state was forced to bail three banks out last year after $1bn (£655m) vanished from their coffers. A leaked report said a 28-year-old businessman, Ilan Shor, was the main co-ordinator and beneficiary - but in an exclusive BBC interview he proclaimed his innocence. Much of the money passed through UK companies. The missing money caused a rapid depreciation of the national currency, the leu, and a decline in living standards. Protesters have demanded resignation of President Nicolae Timofti and other officials, including the governor of the national bank, and early parliamentary elections. Organisers from the Dignity and Justice movement said supporters would stay camped out near the government building in the city's main square until their demands were met. Tens of thousands took part in one of the largest protests ever seen in the ex-Soviet country on Sunday. Many directed their criticism at Moldova's super-wealthy oligarchs - a source of much anger in one of Europe's poorest country.